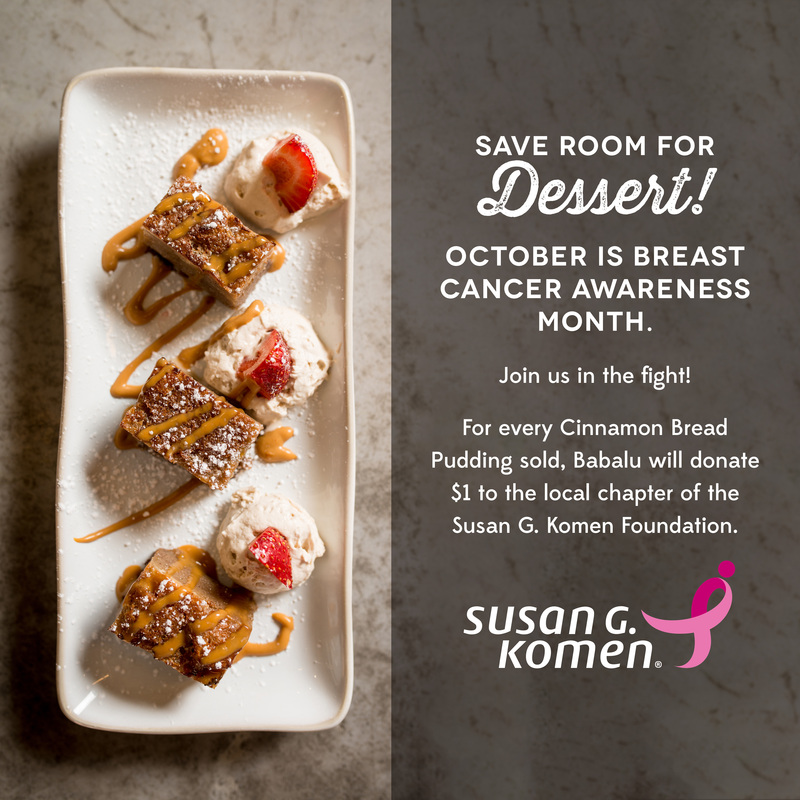 Beginning on Oct. 1, all eight locations of Babalu are launching an ongoing partnership with Susan G. Komen in honor of National Breast Cancer Awareness Month. The restaurants will feature an all-pink menu and donate $1 from each sale of their signature dessert, the cinnamon bread pudding. The goal of this partnership is to increase awareness of the disease, support families that are emotionally affected, save lives by ensuring all people receive the care they need and find breakthroughs to prevent and cure breast cancer. Known for its Latin-inspired tapas menu, fabulous cocktails made with freshly squeezed juices and a fun, hospitable atmosphere, Babalu believes sharing great food leads to the sharing of great times. The restaurant’s house-made cinnamon bread pudding is served with Patron XO chantilly cream, Kahlua caramel and strawberries for the perfect finale to a Spanish-meets-Southern-style meal. With eight locations throughout the Southeast, all Babalu restaurants offer lunch, dinner and weekend brunch. For more information or to find the nearest location, visit www.eatBABALU.com. Founded in 2010 in Jackson, Mississippi, Babalu is a fun, one-of-a-kind, sharing-style dining experience. The restaurant has quickly taken the Southeast by storm and was named to Restaurant Business’s Future 50 list for 2018. The Latin-inspired dishes — each with a unique Southern flair — are sure to bring people together. Babalu is proud to use hyper-local produce and products for its made-from-scratch dishes and handcrafted cocktails. For more information, visit www.eatBABALU.com.